FRISCO, Texas — Fernando Clavijo, a surprise starter for the 1994 U.S. World Cup team who went on to a long coaching and management career in Major League Soccer, has died. He was 63. FC Dallas said he died Friday at his home in Fort Lauderdale, Florida, from multiple myeloma. Clavijo was the team's technical director from March 2002 until he stepped down last September because of his health. Inducted into the U.S. National Soccer Hall of Fame in 2005, Clavijo made 61 appearances for the U.S. national team from 1990-94, mostly as a defender. "Fernando was an important leader with three MLS clubs, and he played a key role in the league's player development strategy," MLS Commissioner Don Garber said in a statement Saturday. "More importantly, he was a joy to everyone who knew him and inspired countless young players." An emerging player in the final years of the North American Soccer League, Clavijo was part of the generation hampered by the lack of the top-level American league between NASL's demise after the 1984 season and MLS's launch in 1996. Born in Uruguay, Clavijo began a 22-year professional playing career at age 16 Atenas of San Carlos, and six years later moved to the U.S. to sign with the New York Apollo of the American Soccer League in 1979. He played for NASL's Golden Bay Earthquakes in 1983 and '84, and he also played indoor soccer for the New York Arrows (1981-83), San Diego Sockers (1984-88), Los Angeles Lazers (1988-89) and St. Louis Storm (1989-92). He became a U.S. citizen in 1987, and debuted for the U.S. team in a November 1990 exhibition against the Soviet Union in Port-of-Spain Trinidad. Clavijo had not started in six games when coach Bora Milutinovic inserted him in place of Cle Kooiman on the backline alongside Marcelo Balboa, Alexi Lalas and Paul Caligiuri for the Americans' second match of the 1994 World Cup against Colombia, among the tournament favorites. Clavijo was not told he would be starting until just before the team left its hotel. The Americans won 2-1 at the Rose Bowl in Pasadena, California, putting themselves in position to advance to the knockout phase. "It's one of the greatest feelings of my life," he said after the match. "I knew this kind of game suits me better. They have a lot of speed up front." At the time, Clavijo's birthdate was listed as Jan. 23, 1957 — it is now listed as Jan. 23, 1956 — and he was the third-oldest player to appear in the tournament behind Cameroon forward Roger Milla (42) and Cameroon goalkeeper Joseph-Antione Bell. Despite his age, Clavijo was the third- or fourth-fastest player on the American team. He made a key play in the sixth minute when Anthony de Avila's shot bounced off American Mike Sorber, hit a post and bounced back into the penalty area. With goalkeeper Tony Meola unable to recover, de Avila's shot toward the empty net, but the ball hit Sorber again and bounced in front of the open goal, where Clavijo cleared the ball. "Somebody had to," Clavijo said. His final U.S. match was the 1-0 loss to Brazil in the round of 16, when he was sent off in the 86th minute after getting his second yellow card. 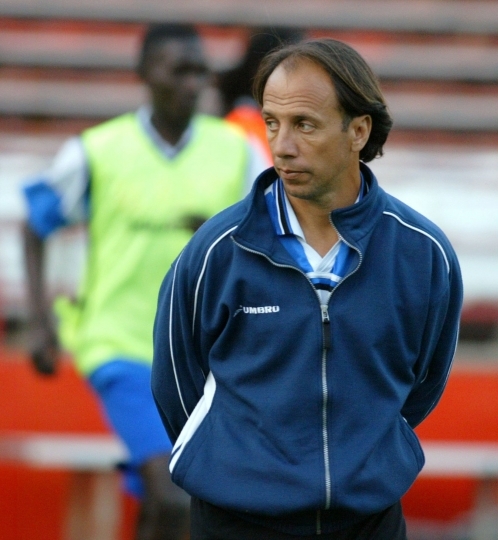 Clavijo started his coaching career as a player-coach with the St. Louis Storm of the Major Indoor Soccer League in 1991. After his playing days were done, he coached the Seattle SeaDogs of the Continental Indoor Soccer League (1995-97), the Florida ThunderCats of the National Professional Soccer League (1998-99). He served as Milutinovic's assistant with Nigeria at the 1998 World Cup and MLS's New York/New Jersey MetroStars in 1999, then was head coach of MLS's New England Revolution from 2000-02. 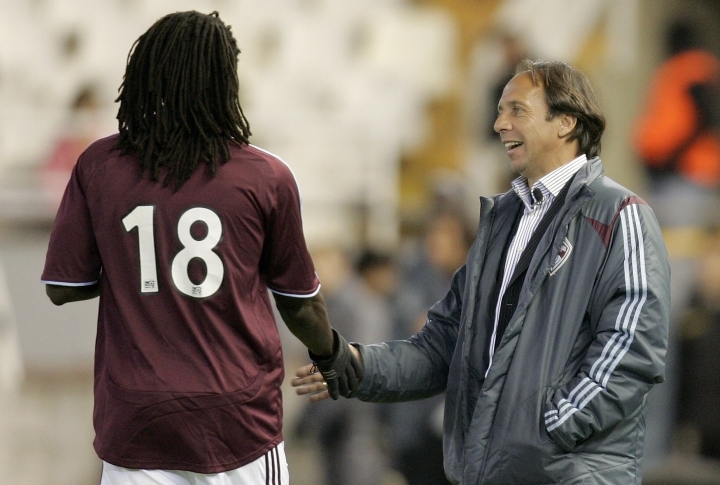 He led Haiti's national team from 2003-05, the coached MLS's Colorado Rapids from 2005-08 before a final coaching stint with Miami FC of the second-tier NASL in 2009. During his tenure in Dallas' front office, the team finished with MLS's best regular season record in 2016, when it won the U.S. Open Cup. "Fernando was a soccer pioneer," FC Dallas President Dan Hunt said. "His knowledge and passion for the sport were unparalleled." Clavijo is survived by wife Martha, sons Nico and Jonathan, daughter-in-law Thanne and grandchildren Lucas and Sofia.